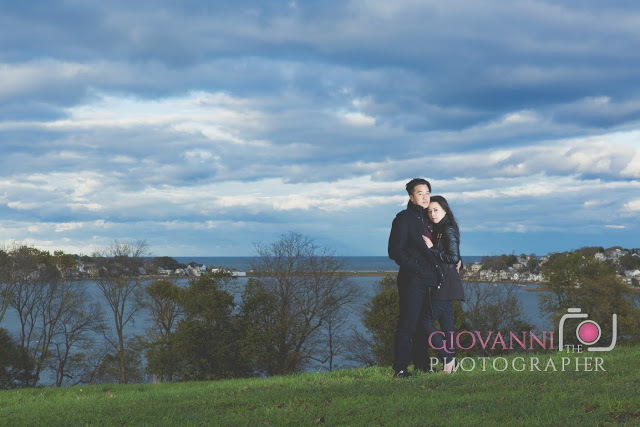 I recently captured engagement photos for Alina and Ray at the World's End in Hingham, MA. This adorable couple dated for 9 years. In March, Ray popped the question at a family dinner where she least expected it. Ray and Alina absolutely love autumn in New England so we patiently waited for peak of leaf season for their engagement shoot. The vibrant foliage made for some breathtaking backdrops for the portraits. Here's are some of my favorite moments from our time together! Alina and Ray are getting married in May 2017 at Hei La Moon in Boston, MA. They are having a traditional Chinese and Vietnamese wedding banquet. I am so excited to capture the wedding videography on their big day! The World's End is one of my favorite locations for portraits. The peninsula overlooks Hingham Harbor and offers so many different options from rustic woods to the romantic views of Hull and the Boston skyline. This is one of the best locations on the South Shore for hiking, picnicking, fishing, horseback riding, and cross-country skiing.